Orrville Red Rider Sports Blog: Pride...Nothing but Pride. Wasn't sure what to write about. Sure, we're all disappointed, but I know I'm more proud than disappointed. What a great run. Twenty one wins, a district title, regional title, and a runner-up finish in the state. We were one of 8 teams in the entire state to be playing basketball yesterday. 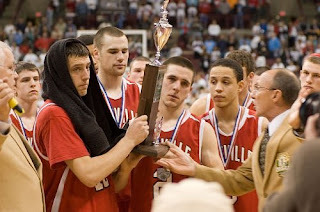 Good Job Orrville! Year in and Year out 1 of the best basketball programs in the state. Showed alot of heart in coming back, was a great season. Pround of the boys and coaches on the team... keep your heads up!! good game! great season riders. you should be proud because you went down fighting. every game you played hard and achieved something many never experience and cant be taken away. be hungry and work hard this offseason and you will be back. Be Proud Riders! Great effort and a great season. Great job Riders!! Many thanks to the players and coaches for an awesome season! Very exciting!Congrats to the team on a fantastic season! You guys have made this town very proud, and brought back that Rider Tradition! Congrats to Coach Slaughter and all the assistants. It was clear from very early on that there was a plan for this program and you all worked hard and sacrificed time with your families to see that plan come to fruition. Congrats to the seniors for an absolutely memorable season. To Joey, Jake, Sam, Chase, Dillon & Andre....thank you for playing hard all year. You each gave us so many memorable moments. To the underclassmen....Max, Zach, Dan, Drew, Jordan, Kyle & the rest....this team is yours next year. You've seen what hard work and hustle can achieve. Build on the foundation. Thank you for giving me plenty to write about and for some experiences I wont soon forget. Media seats at the Canton Fieldhouse & at Value City Arena (thanks to Orrviews) were so cool. Orrville is called a football town, but this season reminded us all that it's just as passionate about the roundball as the pigskin. I'll check in with spring sports from time to time, but this time is traditionally a time where the blog gets a little thin in terms on content. I'd like to work on some long-term projects to add to the site (records, historical things, etc.) that just don't show up from day to day. After a long run in football and a run to the championship game in basketball, I think we're all in need of a battery charging. I'd like to say "thank you" for all who have found this site in the past few months, and for those who check in on a very regular basis. It means the world to me. Good luck to the tennis, baseball, softball & track teams.